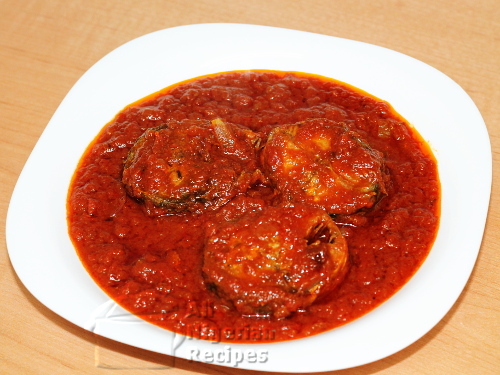 The major challenge when preparing Nigerian Fish Stew is that the fish scatters in the stew. In this recipe, I will show how to prepare this stew and the fish will still be intact. You can see that this stew goes well with virtually every major staple food so you should always have it in your freezer. Tomato Stew is fresh puree tomato and the tinned tomato paste that has been boiled and fried in vegetable oil to remove all traces of water and the sour taste of tomatoes. It is the base stew for all Nigerian Red Stews and Jollof Rice recipes. This is not raw tomato puree. 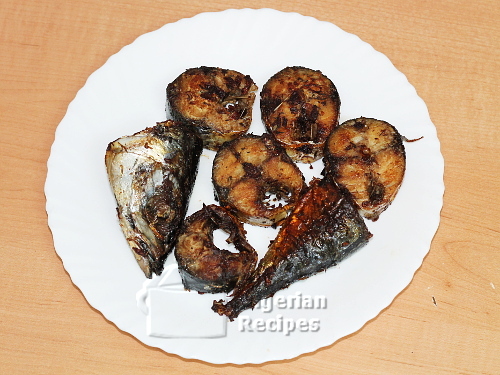 Mackerel (also known as Titus in Nigeria) is the most popular fish for preparing the Nigerian Fish Stew but feel free to use any fish of your choice. Some fish are too soft when cooked and will scatter in the stew because of all that stirring. It is not advisable to use such fish. I prefer red onions for the Nigerian Fish Stew but your can use white or yellow onions if they are the only ones you have. Stock cubes are the seasoning cubes we add to our cooking. The quantities for the seasonings are for guidance only so add the thyme, pepper and salt to your taste. Cut the fish into 1 inch thick cuts and remove the intestine. It is advisable to cut the fish while it is still a little bit frozen. This helps you get perfect straight cuts and keeps the fish from disintegrating. Sprinkle some salt on the fish, rub the salt into the fish cuts with your hands and set aside. Slice one of the onions and dice the other one. Pound or blend the habanero pepper (atarodo, ose oyibo, atarugu). Place the diced onions, crushed stock cubes and thyme in a clean pot. Pour a small amount of water and bring to a boil. Add the fish and leave to boil for 2 minutes. Turn the fish on the other side and allow to boil for another 2 minutes then take them out from the fish stock. For a delicious stew, we need some fish stock (fish water lol) from the fish. The seasoning we add to the fish goes into the fish to make it taste better while the juice from the fish goes into the surrounding water to give it some nice taste that will make the stew delicious. This boiling process helps toughen the fish thereby preventing it from disintegrating in the stew. Set the fish stock aside. Shallow-fry the fish in a small quantity of vegetable oil till golden. The difference between deep-frying and shallow-frying is that in shallow frying, you use less amount of oil and the fish is not immersed in the oil. Both of them are great but I just think there is no need to use all that oil in frying especially when I can achieve the same thing with shallow frying. Also, I do not like my fish bone-dry as that is what we often aim for with deep-frying. Set the fish aside and set the pot with the fish stock back on this stove (medium heat). Once it boils again, add the tomato stew and habanero pepper. Add some water to bring the stew to the consistency you like for your stews. Some people like their stew watery, some like it conc and some like it somewhere in the middle. Add salt, stir and cover the pot and leave to simmer (boil) till you see some oil float to the surface of the stew. This is the oil from frying the Tomato Stew, no extra oil is added to Fish Stew. While waiting to see the oil, stir the stew at intervals so it does not burn. Once you see the oil at the top (watch the video below for what it should look like), add the fried fish. Stir, cover and once it boils again, the stew is ready! Use the Fried Fish Stew to eat Boiled Rice, Fried Plantain, Boiled Plantain, Fried Yam, Boiled Yam and Agidi, plain boiled beans, boiled potatoes or serve it with Egusi Soup.